If you are an Exchange administrator, you might have worked with Exchange Management tools. And while you might enjoy the power and flexibility of these tools, you might be missing the ability to get a graphical overview of user mailbox details. This add-In makes it easy for Exchange administrators to visualize, explore, and communicate complex information. Instead of viewing single user data, administrators can create data-connected Visio diagrams that display data at a glance and dramatically increase productivity. 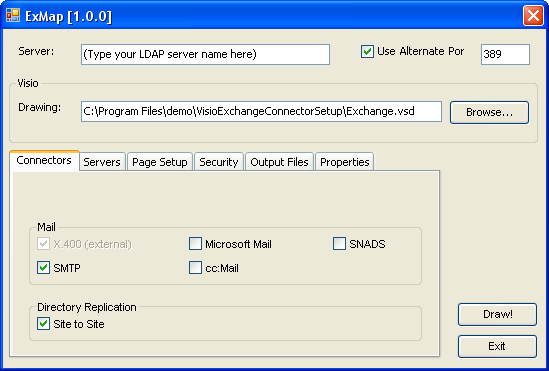 You can diagram a Microsoft® Exchange Server 2007 site topology, including sites, servers, and connections for an organization. On the download page, they keep going on about Visio 2007 Professional, but I don’t see in the software requirements that you have to have Pro. It may be that the add-in will theoretically work with Pro or Standard, but only Pro has the shapes that the add-in needs. This is where I stopped, deciding not to install a Virtual PC with all the required software, yada, yada, yada. Sso I’ll leave it to you to read more about the Exchange Server Add-in, which you can do on Visio Toolbox here. And can find out how to actually run, configure and use it in this Word document. Evidently, Microsoft have been quite busy creating add-ins and connectors for Visio, and I should probably do some research and write another article or two! I’ll have a look. Sorry for the inconvenience! I would like to be able to master the Visio Website map creation tool. Can you point me in the direction of a good reference? My apology. I am new to the blog thing. I didn’t pay attention to the lead article at the top on the Visio 2007 Exchange Server. I am just looking for help with the Site Map Tool in Visio Professional 2007. Is there any other possibility to get this Add-In ? I’ve found a new Version of this Addin for Visio 2010 and Exchange 2007. Thanks for the update, Flupqie! Do you guys know how to actually use the Visio 2010 add-in? I’ve downloaded and installed it, and when I look at the COM Add-ins in Options I do see it there and activated… but I don’t see any additional buttons or actions on the ribbon bar…. Ah, got it all figured out! There’s no addition to the ribbon bar, but if you choose to create a new diagram, and then under the template categories look in the Add-Ins folder, you’ll see the Exchange Connector template. The other bit of trouble I ran into is that there are two server fields to fill out, one labeled Exchange Server and one labelled Domain Controller. You actually have to put your Domain Controller into BOTH boxes!